"Discovery is the ability to be puzzled by simple things"
Tafuri Castle datable to 1935 stands on a steep cliff on the south-eastern coast of Sicily, opposite the island of Capo Passero (SR); set against a crystal clear blue sea, it is perhaps the most prominent attraction in the area. For many years it has been the symbol of this small fishing village, today a destination for tourists and surfers. The history of the castle has been almost completely reconstructed. 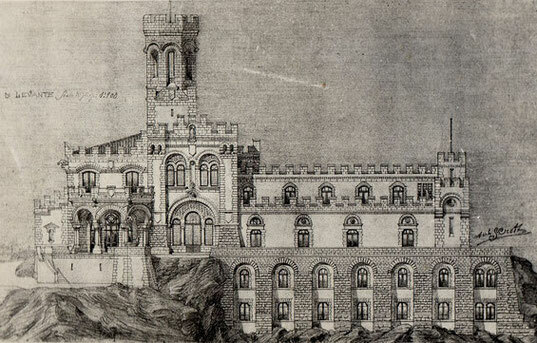 The construction of a castle-style villa on behalf of Franzo Bruno di Belmonte was entrusted to the architect Crott from Florence. Severino Crott (Castiglion Fiorentino, 1886-1972), known for numerous extension projects to religious buildings, period style extension work and reconstruction projects for churches with strong features from the Gothic and Romantic eras, worked for the first and only time in Sicily on the castle. He drew up the project in 1933 and work started in 1935. We do not know exactly when works were suspended, probably due to economic problems, but it is certain that the castle remained incomplete until 1957 when it was bought by the Tafuri family. The castle was completed and converted into a hotel in 1964 and extended in 1971-72. In 1986 it was rented to third parties until finally closing in 1998.